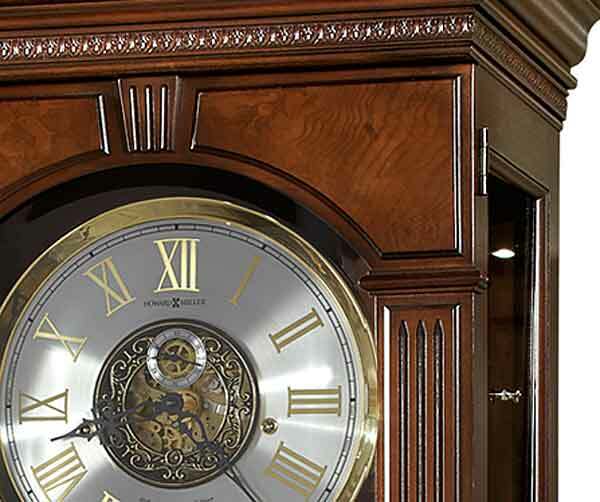 Howard Miller Alford 611-224 88Th Anniversary Edition Grandfather Clock with a Hampton Cherry finish with Free In-Home Delivery. Special 88th Anniversary Edition. Lightly distressed Hampton Cherry finish on select hardwoods and veneers. The dial features an open center which offers a view of the inner workings of the movement, a polished brass-finished bezel and includes a silver chapter ring with applied brass-finished Roman numerals and black serpentine hands. The polished brass-finished pendulum has a cast center disk which complements the dial and polished banded brass-finished weight shells. The front door features book-matched olive ash burl overlays with a fluted keystone and fluted columns. 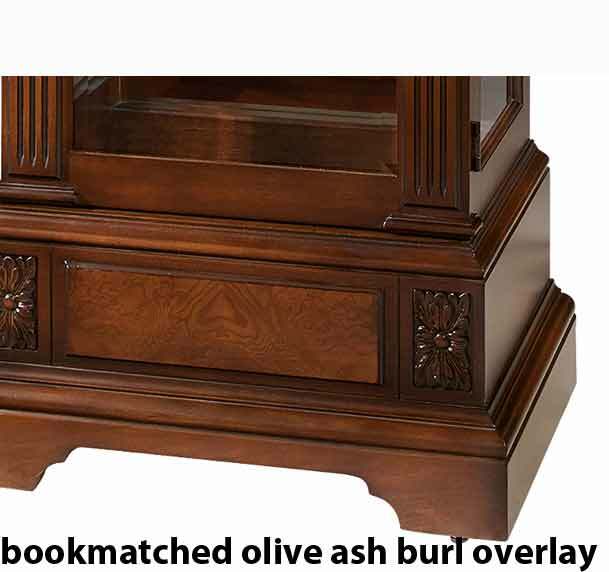 A book-matched olive ash burl overlay continues on the multi-tiered base with two carved ornaments. Illuminated dial and case with a glass mirrored back. Free Heirloom Record Certificate with brass-finished capsule is included. 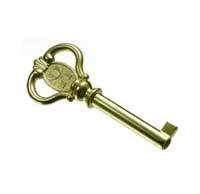 Free brass Heirloom Nameplate will be engraved with your name and special date. Four floor levelers level the cabinet on any surface. German built cable-driven,Westminster chime Kieninger movement plays 1/4, 1/2, and 3/4 chimes accordingly with full chime and strike on the hour.Automatic nighttime chime shut-off lever and all chime silence lever. Size: Height 81.25" Width 24.5" Depth 14.5"
FREE Remote control to turn ON / Off the Illumination in this clock. Clocks for sale at The Clock Depot including the 611-224 at discount prices.